Does your organization still use PC’s, I thought so. We offer 3 courses that cover installation, configuration and support of Windows 10 both in both a simple Windows Server environment or large enterprise deployment. 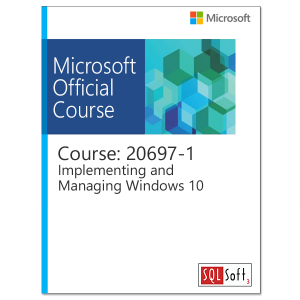 Course 20692-1 provides students with the knowledge and skills required to install and configure Windows 10 desktops and devices in a Windows Server domain corporate environment. The enterprise course 20692-2 provides administrators with the knowledge and skills necessary to deploy and manage Windows 10 desktops, devices, and applications in an enterprise environment including secure identity and data access using technologies related to Group Policy, Remote Access, and device registration. Azure Active Directory, Intune, and Azure Rights management all part of EMS (Enterprise Mobility Suite) are also introduced. The support course 10982 is designed to provide students with the knowledge and skills required to support and troubleshoot Windows 10 PCs and devices in a Windows Server domain environment including understanding of Windows 10 features, how they can be used in an Active Directory environment and how to troubleshoot them. The courses feature hands on labs that allow you to apply and practice what you’ve learned. Many courses are also available in the MOC On-Demand format.